Wall-mounted stone tablet with substantial green marble surround. 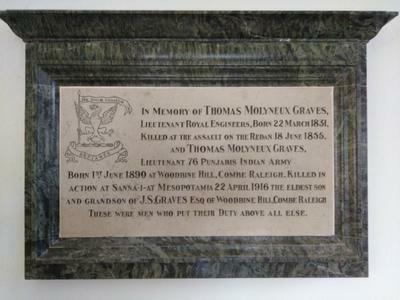 IN MEMORY OF THOMAS MOLYNEUX GRAVES /LTN. R.E. BORN 22 MAR 1831./ KILLED ON THE ASSAULT ON REDAN 18 JUN 1855/ AND THOMAS MOLYNEUX GRAVES /LTN. 76 PUNJABIS INDIAN ARMY/ BORN 1 JUN 1890 AT WOODBINE HILL COMBE RALEIGH. KILLED IN/ ACTION AT SANNA-I-AT MESOPOTAMIA 22 APRIL 1916. THE ELDEST SON/ AND GRANDSON OF J.S. GRAVES ESQ OF WOODBINE HILL, COMBE RALEIGH./ THESE WERE MEN WHO PUT THEIR DUTY ABOVE ALL ELSE.